You Save: $4.78 (32%) Ships in 1 day. Soft Cover, 234 pages, 5.75 x 8.5. Murder and Death, Cow Mouth, Gut Rot, Bitchy Maid. The story of how Kolsch shed its dismal reputation in the Middle Ages to become Cologne's queen of beers is definitely one to be savored. Home to this delicate golden ale, Cologne (Ksln in German) enjoys one of the oldest brewing traditions around. (Its first documented brew was in A.D. 873!) 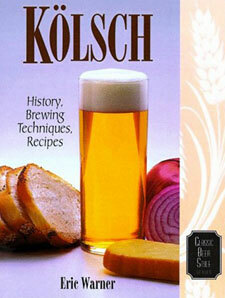 Number 13 in Brewers Publications' popular Classic Beer Style Series, Kolsch offers in-depth information on the history, flavor profile, brewing methods, recipes such as Lawnmower Kolsch, and ingredients of this quintessential beer. A graduate of Germany's famous brewing school, Weihenstephan, Warner shares all he knows about how to brew a Kolsch as well as some tried-and-true recipes. Also included is a listing of where to go in Cologne to enjoy an authentic Kolsch experience, complete with a stange of beer and a meter of sausage. Eric Warner co-founded Tabernash Brewing Company, a microbrewery specializing in Germany-style beers, including his award-winning Kolsch. Today he is vice president of operations at Broadway Brewing Company in Denver, Colorado.